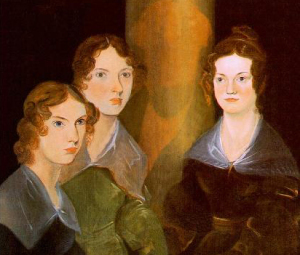 The socially-awkward, undeniably brilliant early feminists, the Brontë sisters, are our featured authors this week. Fathered by a generous Anglican priest, the Brontës’ affection-filled childhoods of imaginative games, toys and abundant literature was tempered by the death of their mother and both of their elder sisters, who had died after poor treatment at boarding school, at which all the Brontë girls except for Anne were enrolled. After educations in more caring and less tuberculosis-filled surroundings, Anne, Charlotte and Emily all started their writing careers under male pseudonyms, following the custom of female authors at the time. Contrary to their timid public natures, however, they produced works of fiction that challenged the moral standards of Victorian Britain, shocking their readers with portrayals of women who strove towards maturity, fulfilment and independence. Although they share many similarities in their writing, the Brontës all had their own thematic concerns and distinct narrative voices. Charlotte and Emily’s writings were particularly influenced by Romantic writings, especially those of Lord Byron: Charlotte’s Jane Eyre and Emily’s Wuthering Heights (both published in 1847) feature timid women struggling in their relationships with dark, arrogant, but frustratingly attractive men. Anne, however, thought that books should provide moral education, and was greatly influenced by her time as a governess, as well as the death of the girls’ only brother Branwell from alcoholism-onset tuberculosis. All of the Brontës died young, in fact: none of the siblings managed to reach 40, and were all outlived by their father. But even with only a combined output of seven adult novels (four by Charlotte, two by Anne and one by Emily) and one collaborative book of poetry between them, the Brontës scaled the heights of English literature, writing some of the most influential novels of all time and paving the way for more women writers to ply their trade for the remainder of the 19th century – and a long time after that, too. We are proud to have every Brontë novel, as well as their book of poetry, available right now on Paperight.